Larry Achiampong, ‘Ph03nix Rising: The Mogya Project’ Live Performance (2016-2017). Image courtesy of the artist. In advance of ‘History Lessons: Fluid Records’ event at South London Gallery, Something Human interviewed participating artist Larry Achiampong. Larry Achiampong (b. 1984, UK) completed a BA in Mixed Media Fine Art at University of Westminster (2005) and an MA in Sculpture at Slade School of Fine Art (2008). 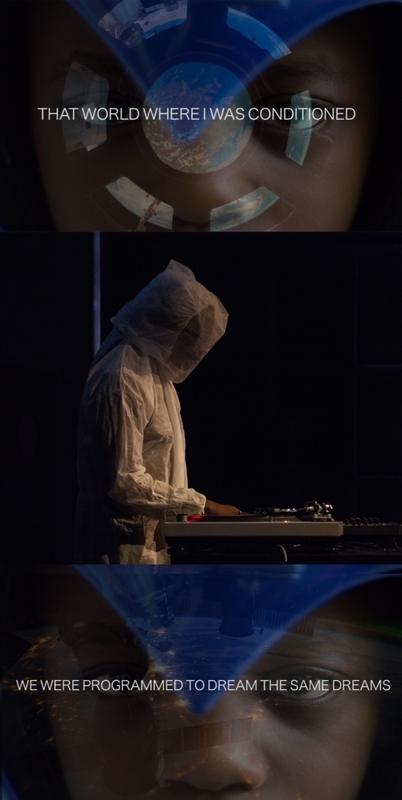 Achiampong’s solo and collaborative projects employ imagery, aural and visual archives, live performance and sound to explore ideas surrounding class, cross-cultural and post-digital identity – in particular, dichotomies found within a world dominated by social media and digital frameworks. Achiampong has exhibited, performed and presented projects within the UK and abroad including Tate Britain/Modern, London; dOCUMENTA 13, Kassel; The Institute For Creative Arts, Cape Town; The British Film Institute, London; Modern Art Oxford, Oxford; David Roberts Art Foundation, London; SAVVY Contemporary, Berlin; Bokoor African Popular Music Archives Foundation, Accra; The Mistake Room, Los Angeles; and Logan Center Exhibitions, Chicago. Achiampong is currently exhibiting artwork in the Diaspora Pavilion at the 57th Venice Biennale, and is displaying his flag commission atop of Somerset House until late January 2018. He lives and works in London. Something Human is an independent curatorial initiative interested in exploring movement and relationships across boundaries, through our shared multidisciplinary interests in architecture, design, sculpture, mixed media, photography, moving image and performance. We actively seek collaborations with artists, makers and producers from different cultural and socio-political backgrounds, for exchange and dialogue with an aim to create new, exciting performative-driven works. Something Human is a collaboration between Alessandra Cianetti and Annie Jael Kwan.